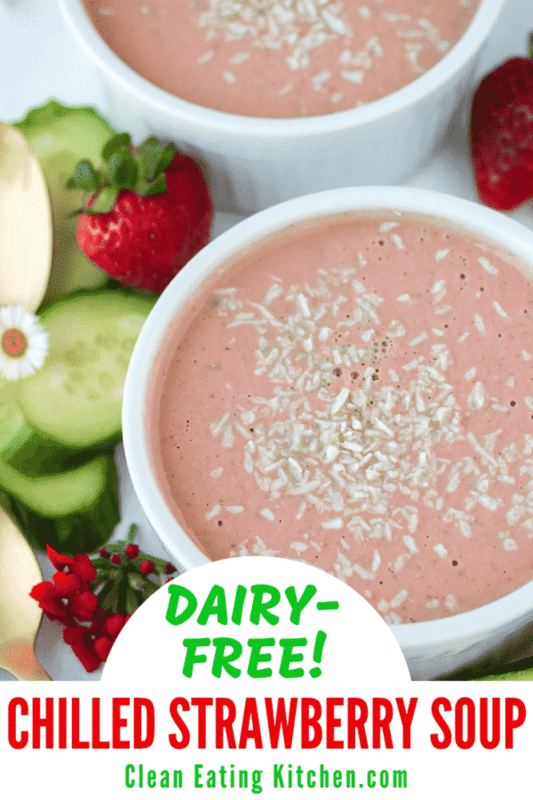 This Vegan Chilled Strawberry Cucumber Soup is a delicious fruity twist on cold soup, but made dairy-free and healthy using strawberries, cucumbers, coconut cream, lime juice, and vanilla. With record-breaking temperatures across the country, who wants to eat anything remotely hot? We’re only at the very beginning of our first big heat wave here in California, but I’ve already declared a moratorium on using my oven for the rest of the summer. That means you can expect a lot of blender, Instant Pot, and slow-cooker recipes for awhile, ha! 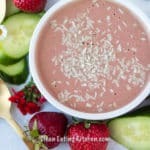 For this Chilled Vegan Strawberry Cucumber Soup recipe, I used strawberries fresh from the farmers’ market. 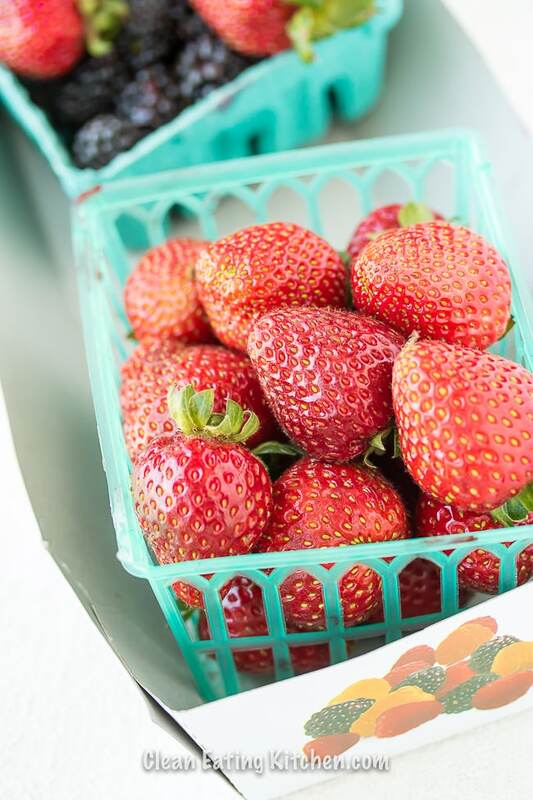 It’s actually nearing the end of strawberry season, but they are still in abundance at the markets, along with other berries. And, side note, I saw the first of the stone fruits at the market this week too. Yum! 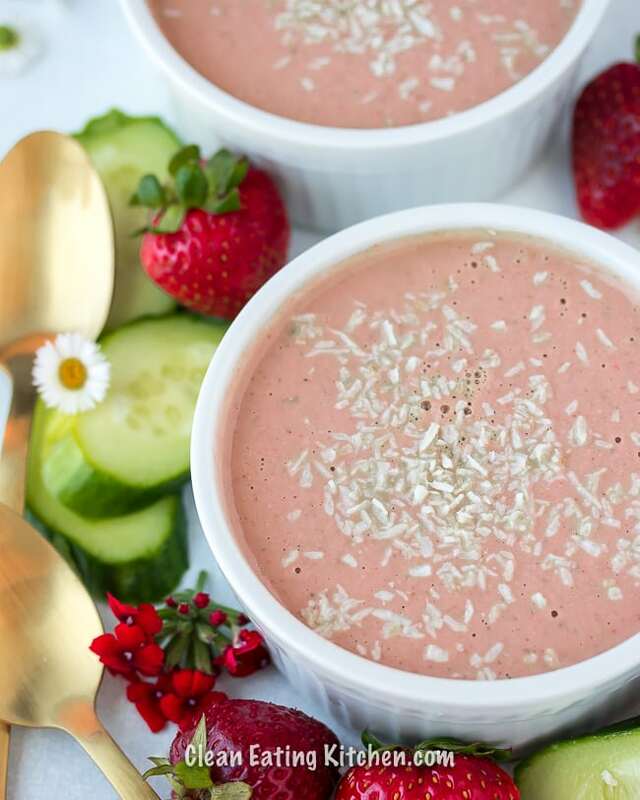 Back to this Vegan Chilled Strawberry Soup recipe, I used only five simple ingredients including strawberries, cucumber, coconut cream, lime juice, and a splash of vanilla extract. 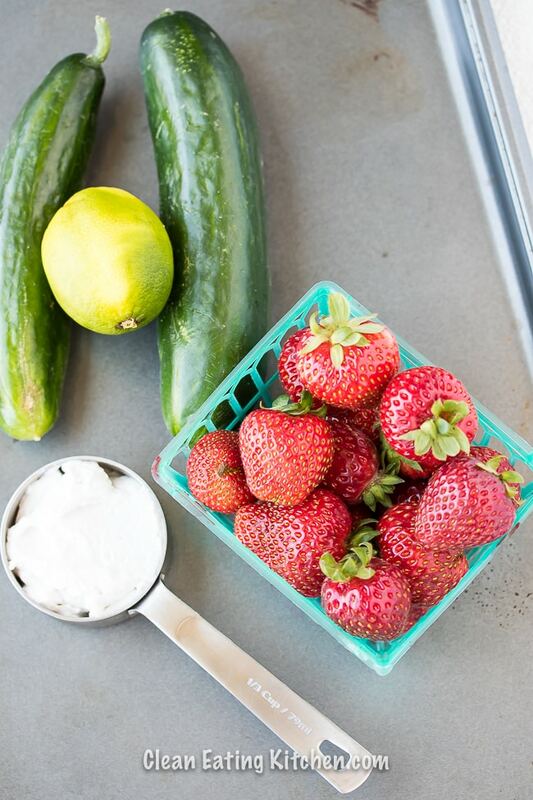 Cucumber might seem like an odd pairing with strawberries, but cucumbers are so mild that they seem to pair with almost anything. I usually juice my cucumbers (see my Celery Cucumber Green Juice recipe here), but blending them into a smoothie-soup retains all the fiber and nutrition. The ingredients are a given for a sweet fruity soup: fresh strawberries, coconut cream, vanilla, and fresh lime juice to brighten all the flavors. If you have a real sweet tooth, you might want to add a squeeze of raw honey to the mixture, or a couple of Medjool dates to keep it vegan. Also, for my paleo friends, feel free to add a scoop of collagen peptides to add some balanced protein. To make the soup, all you have to do is combine the ingredients in a high-speed blender (a refurbished Blendtec is one of the best investments you’ll ever make in your health, trust me)! This soup is best served chilled, so you can either blend the ingredients when they are cold, or just chill the soup in the refrigerator after blending but before serving. Questions about making this vegan and paleo chilled soup. Can I use frozen strawberries for this recipe? Yes, absolutely! You need to defrost them first, otherwise you are going to end up with a smoothie and not a soup. Which, would be good, but you might also have a hard time blending the ingredients. So, if you want to use frozen strawberries, just measure out 1 cup and let them defrost overnight in the fridge first. Can I use an English cucumber instead of Persian cucumbers? Yes, but Persian cucumbers are known to be “burp-less” and easier to digest. My preference for this recipe is to use Persian cucumbers. You don’t need to skin them, either. Can I use a regular blender? Yes, of course, but your final consistency won’t be as smooth. Can I use regular coconut milk or lite coconut milk instead of coconut cream? Yes, but the nutrition data I’ve included won’t be as accurate and your soup won’t be as rich. Feel free to ask me any other questions in the comments section below! 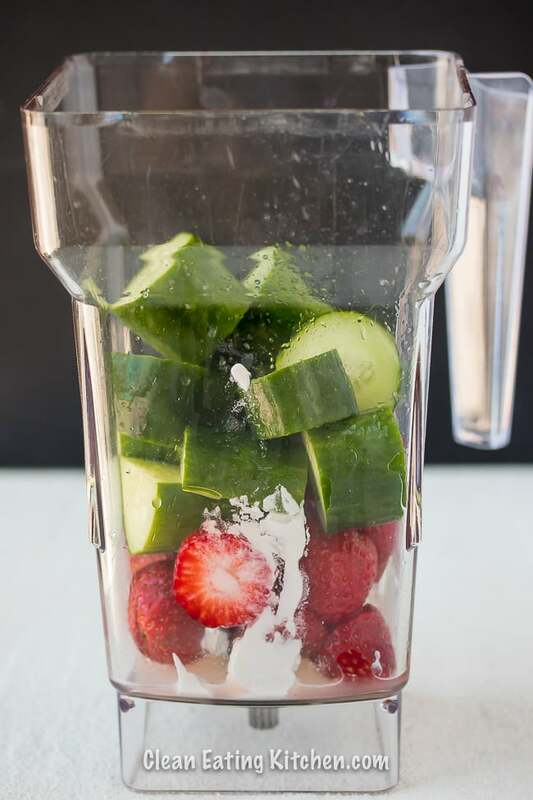 Combine the strawberries, cucumbers, lime juice, coconut cream, and vanilla extract in the base of a high-speed blender or food processor. Process on high until the ingredients are combined, about 30 seconds. Serve immediately or place the soup in the refrigerator to chill for about 30 minutes before serving. If you prefer a sweeter soup, feel free to add 1 tablespoon of raw honey or 2 Medjool dates to the blender. Also, for paleo friends, feel free to add 1-2 scoops of collagen peptides to the blender to add protein to this soup. Hope you stay as cool as a cucumber, friends. Hee hee! 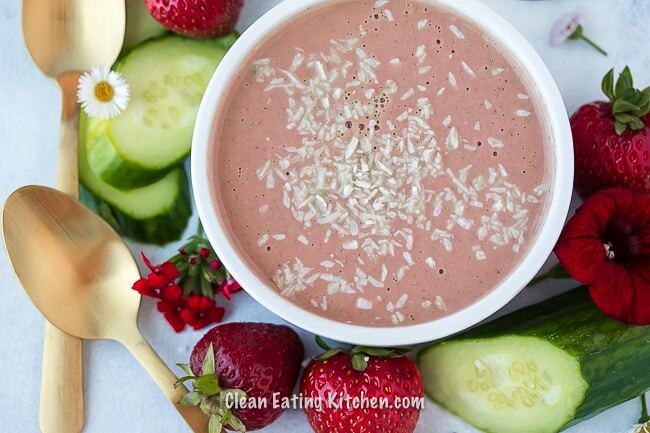 Strawberry and cucumber together….yummy & refreshing! Thanks Carrie, for sharing this wonderful recipe! The picture shows what looks like coconut oil. The coconut cream I always see is more of a consistency of eagle brand. Is that the same? where can I get coconut cream that is that thick? Hi Susan, you can buy canned coconut cream OR just use the thickened part of full-fat coconut milk in a can (drain off the liquid). Does that help?